Extra curricular activities finish tomorrow and will resume on Monday 11th January. Priority next term will be given to children already enrolled this term. Thank you all for your generous response to our Focus Ireland appeal. The hampers will be on display tomorrow morning in the corridor. We have had some good age appropriate discussions in the classrooms about why people become homeless and what it must be like to be homeless over the past week. If there is anyone else available with a hatchback or a big boot (or a small van) who could help us deliver the hampers to the Focus Point offices in Christchurch Place tomorrow morning around 10.30am, that would be fantastic – just email by return for my attention or mention it to Assumpta Neylon in the morning. The theme this year is New Year around the World. Just to remind you that we ask you not to bring along toddlers or preschoolers as it can get very noisy and packed and it is not fair to the young children on the stage (who are small themselves) to have lots of noise in the audience. Other family members are most welcome. Each show will start promptly and last for about 50 minutes – please stay in your seats for the full show as it is very dispiriting for those on the stage to see people leaving during the performance. Coffee and tea will be served between 10.30 and 11am upstairs in the Seomra Spraoi – please do not bring coffee cups and plastic containers with you into the hall before or during the show. Children may go home after their show – but must be collected from their classrooms at the end of each show. Children are not permitted to leave during the shows. All the pupils will have seen the full show the previous day. It is a busy time of year and we all get a bit frantic, but an hour to enjoy the children and their drama and singing is to be cherished. In line with trying to be more mindful, and to help us all to enjoy the show as it happens, we would ask you to minimise the use of cameras and video during the performance. Get your decorations up. All decorations should be hanging by 15th December and will be available to take home after the concert on the 18th. 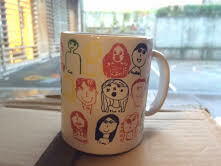 Last chance to purchase a mug - please go to the school website, www.rmds.ie, click on the contact button and scroll down to the Easy Pay school items and activities button. Cash can also be left in the office. The mugs will be given to your child to take home. There are just two senior infant mugs left and a small number in R6, R4, R2, R1 and junior infants. A great stocking filler and present for grandparents!